As April turns to May, people in Europe, North America and more northerly parts of Asia are thinking of the coming summer, with sunny skies, warm balmy days and BBQ's in the garden. It's summertime and the livin' is easy... Here in Phuket, the weather doesn't have the same 4 seasons as "back home". We don't get cold weather, I have no use for warm clothes save for the occasional early morning ride on the motorbike, you can wear polo shirts and shorts every day. We don't have a spring with the bluebells flowering in the woods, we don't have an autumn with golden leaves. But - we do have weather! High season is when (on average) you get the best weather - meaning more sun and less rain. This is approximately November to April. It can rain anytime, but the prevailing winds at this time are from the North East, bringing little in the way of storms and rain. 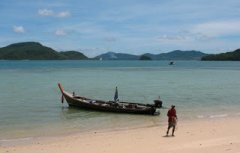 Also it means that the west facing beaches in Phuket are sheltered and calm. So, this is when most of the tourists come. It's also when all the hotels are more expensive! Low season . From May to October we enter the South West monsoon season, meaning prevailing winds are from the South West, coming across the Indian Ocean bringing (on average) more rain than the high season. The winds also mean that the beaches are sometimes too rough for swimming. Many guidebooks and travel agents will tell you the weather is always bad at this time of year and many people believe it. Of course, that's nonsense. Low season rocks. 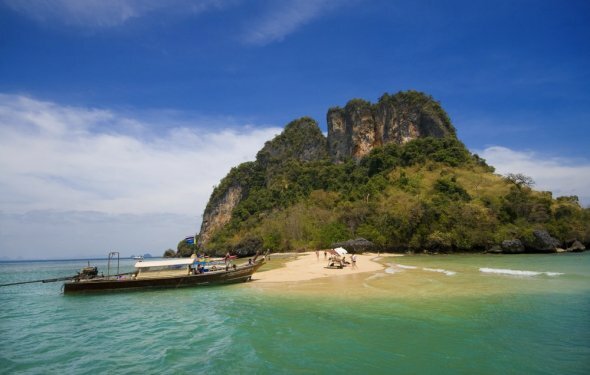 Low season is a great time to visit Phuket and the rest of Thailand. That is, so long as you don't mind occasional rain and don't want to sit on a beach for 2 weeks. You'll get sun much of the time, most days are hot and you start to wish it WOULD rain just to cool things off! The rain that does fall mostly comes right at the start and end of the season. May, September and October are (on average) the wettest months in Phuket. Now you might be unlucky at any time and get a few days of wet weather but don't worry - there's plenty you can do here on a wet day. The "low season monsoon rains every day" myth (and it is totally a myth) is why I started a weather page on the Sunrise Divers website many years ago. To record the weather and show what it's really like, rather than relying on averages and forecasts that always say "chance of a thunderstorm". My parents have visited from the UK a couple of times in July and I guess we had 80% good weather and the little rain that fell never stopped us doing anything. They also visited one time in April and there was more rain than the low season! Ah, Pacha Mama playing tricks on us. 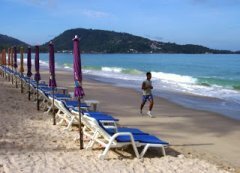 In 2006 I started my personal Phuket Weather Blog. If you take a look at the blog archives you'll see what the weather was really like. As for what it will be like - it's anyone's guess, I don't trust forecasts, though you can find a whole load of weather related links on my weather blog that may help. You can do anything in low season that you can in high season. And there are advantages. Main advantage? HOTEL PRICES - a bargain can be had in the summer as hotels compete for limited numbers of guests. Big resorts drop prices dramatically, while cheap guesthouse rooms can be down to a few hundred Baht. 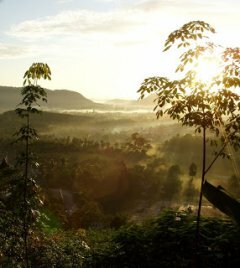 Another plus - the colour Green - many locals call this time of year the Green season, as the rain that does fall is lapped up by the tropical plants that cover Phuket. Another plus - less crowds. Yep, this is not package tourist season, so you have more space to move, more room on the beach, less crowds at the main sights, less divers in the water, more breathing space in the restaurants. Sure it rains sometimes, sure you will have wet and windy days now and then, but you will almost certainly get way more sun than rain. Check out my weather pages for the reports and I hope to see you in Phuket this summer! Bring your umbrella and factor 30.